Home surveillance systems have come a long way. They started with a licensed installer coming to your home with bulky equipment and endless strings of cords. High monthly bills and lousy image quality followed. Today, we have access to DIY solutions that you can install yourself and monitor from your phone. If you want to purchase your own home surveillance cameras but aren’t sure where to begin your search, we’ve got some tips for you. Should I Get Outdoor Cameras? How Easy Are Security Cameras To Install & Where Should They Go? One of the biggest concerns is how simple the camera installation is. Fortunately, most security cameras have DIY set-ups that take less than 15 minutes. However, there are some that require a little more work (i.e., CCTV systems). Our Home Security Camera Installation article has all the details on where you should place your cameras, how to install them and other tips. There are a few things to consider before choosing your cameras. We suggest making a list and looking for the best surveillance camera that meets your needs. Some items we feel are “must haves” while others may be optional for you. Night Vision – This is important since many crimes take place in the dark or at night. The best cameras have night vision, to catch the criminal’s face or license plate in the dark. Check out our top picks for the Best Night Vision Cameras. Motion Detection – We suggest getting a camera with motion detection, so your camera isn’t recording 24/7. Constant recording takes up a lot of storage space, and if there is a crime committed, you’ll have to watch through all of that footage. Field of View – The size of the area you want monitored will determine the field of view. Is a wide-angle lens necessary? Ultimately, this will be up to you. Consider where exactly you might place a camera before purchasing. Zoom, Pan, Tilt – Make sure your camera(s) point in a direction that allows the criminal’s face to be seen clearly (a zoom feature can help a lot here). Think about where the criminal might break, and how, when you consider placement and angle of your camera. If you’re covering wider areas we recommend a camera that pans and tilts as well (many of these are controllable remotely, via your smartphone, and can also be motion triggered). Wireless or Hardwired – Do you have room for the cords to be plugged in? If not, wireless may be the route to go. Keep in mind that with wireless, you may need to replace the batteries, which could increase your costs. (Some cameras are solar powered or use rechargeable batteries.) You will also need to access the camera, which may include climbing a ladder regularly to reach it. Consider these things before purchasing. Number of Cameras and Price – How large of an area needs covering? Does the area require multiple cameras? Do you have a budget for each camera, or the entire system? These are all questions you’ll want to ask yourself when making your purchase decision. 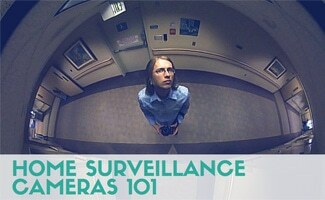 It’s also important to learn about the laws in your state regarding the legality of filming people from a surveillance camera placed on your property. This is often overlooked, but is an important consideration before buying anything, especially if you plan to use any intrusion video in court. Are WiFi Cameras For Me? WiFi cameras connect to your internet and typically can deliver footage through an app. These are much easier to install, but they can be less reliable if you have an inconsistent internet connection or someone severs the internet connection to your home. WiFi cameras are easy to relocate since all you have to do is plug them in (some don’t even require this step) and connect them to your WiFi. We’ve reviewed the Best WiFi Security Cameras. Additionally, we’ve written about individual cameras like Foscam and Arlo, which are both popular WiFi surveillance camera options. What’s A CCTV Security Camera System? CCTV (Closed-Circuit Television) systems are wired security camera systems. They typically require a video recorder to capture the footage in digital format. The recorder has wires to each camera, and if a criminal cuts a cable, or the recorder is damaged or stolen, the footage may be lost and recording interrupted. CCTV systems are commonly used in businesses because they are considered to be more reliable since there is no risk of a lost connection due to wireless signals. They also support more cameras (sometimes up to 16), so they can monitor multiple areas on the property. Read our review on the best Best Security Camera Systems for our recommendations. An increasingly popular type of security camera available today are doorbell cameras. Package theft is occurring more frequently with the abundance of online shopping consumers are doing, so monitoring the front door is a necessity. Doorbell cameras replace your existing doorbell with one that includes a camera. Download an app onto your phone and get notifications when someone rings your doorbell or motion is detected (depending on the brand you buy). If someone tries to break into your home or steal your package, you can speak to them through the doorbell to try to scare them off. You’ve probably heard of Ring’s doorbell camera as it was one of the pioneers in this space. But did you know there are other companies you can choose from as well? Read our doorbell comparison article to see which one we chose as the top pick. Video surveillance around the exterior of your home can help scare off intruders before they even try and step foot into your house. If they’re still gutsy enough to break into your home, you may be able to bring them to justice (as long as you have your cameras installed in the right places). Find out which outdoor security cameras we recommend. Some cities ask you to register your security cameras in case a crime takes place nearby so they can see if there are any cameras in the area that may have captured the activity. Be sure to check with you local laws and if you’re unsure, you can contact the police department yourself. Need an opinion on a security camera? Ask us! Thanks for mentioning how surveillance cameras should have night vision. I also like how you said that it should sens motion as well. My husband and I are looking for surveillance cameras; thanks for the post. Thank you for this wonderful post. And like the other comment mentions, resolution is an important characteristic to consider. It is 2016, and 1080p has become a standard of sorts for surveillance cameras but it is still worth mentioning for someone going in for the first time. One other thing to look for that I might add is resolution. Some cameras have really crappy quality and the better the resolution the more likely you are to see the details of the person’s face, features and plate number. People often skimp and get the cheapest camera, but since you’re already spending the money it’s worth paying a little more to make the camera more effective.